The fossil bed and Triassic bed are located on the west side of the conservatory, at the entrance to the Gondwana Garden. The fossil bed represents the type of veld in a part of the Eastern Cape where fossils from the Triassic period (about 200 million years ago (mya)) are common in the shale rock band below the cave sandstone. Look closely at the rocks in the foreground and you will see fossils in them. 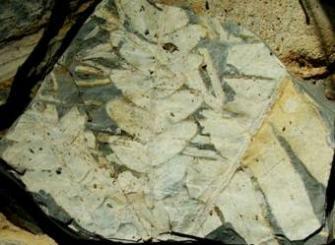 These fossils are the remains of plants that grew in the Eastern Cape 200 mya. On the other side of the path is the Triassic bed. It depicts the type of plants that would have been growing during the Triassic period (200 mya), such as ferns, mosses and cycads. These are the kind of plants that we find as fossils in the Eastern Cape today. Look closely in the exhibit for the reconstructions of some of the creatures that lived then. The Gondwana Garden is named after the Gondwana continent, the huge landmass that existed 650 million years ago and broke up ±180 million years ago to form Africa, South America, Australia, New Zealand, India and Antarctica. These continents share rocks and fossils. Families of living plants, like the Protea Family, occur only in these lands, and are evidence of their shared past. 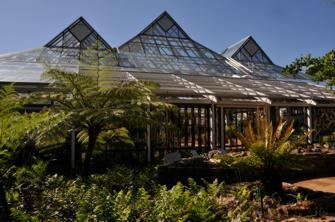 The Gondwana Garden features the plants that grew on the ancient continent of Gondwana. It displays both the fossil and the living flora of the modern continents, and is one of the few gardens in Kirstenbosch where exotics, (plants not indigenous to southern Africa) are cultivated. You will see 240 million year old fossil tree trunks of Araucarioxylon from Senekal in the eastern Free State, and living specimens of the trees most similar to it alive today. Other ‘living fossils’ on display here include Ginkgo biloba and cycads, Cycas species and Encephalartos species, fossil relatives of which are found in southern African rocks from the Triassic period (200 mya). Also to be found here are tree ferns, Cyathea / Alsophila species and Equisetum gigantea, whose fossil relatives are found in the Permian deposits (280 million years ago). You will also see specimens of some of our most ancient rock formations, the Barberton and the Witwatersrand (Gold Reef) formations laid down about 3000 million years ago.